TORONTO, Feb. 24 /CNW/ – Alberta’s housing market officially became the most affordable in Canada in the fourth quarter of 2010, according to the latest Housing Trends and Affordability report released today by RBC. Thanks to lower mortgage rates and further softening in home prices, RBC’s Affordability Measures for Alberta fell yet again in the fourth quarter, by 1.0 to 2.4 percentage points, extending their long strings of declines since late 2007. The RBC Housing Affordability Measures for Alberta, which capture the province’s proportion of pre-tax household income needed to service the costs of owning a home, eased across all housing categories in the fourth quarter. The measure for the benchmark detached bungalow moved down to 30.9 per cent (a drop of 2.4 percentage points from the previous quarter), the standard condominium to 20.3 per cent (down 1.0 percentage points) and the standard two-storey home to 34.4 per cent (down 2.2 percentage points). The RBC report notes that gradual and steady improvements in Calgary’s housing demand have recently started to bolster market conditions as home resales increased appreciably since June which helped trim down the slack that kept buyers in the driver’s seat. A return to more balanced market conditions in Calgary, however, did not succeed in reversing the tide in the fourth quarter of 2010 as home prices continued to weaken for the most part in the fourth quarter. Nonetheless, this contributed to further material improvement in affordability. The RBC Measures for Calgary again fell the most among Canada’s largest urban markets, declining by 0.9 to 3.1 percentage points. “Affordability in the Calgary area is now the best in almost six years and this attractive level of affordability will support further increases in demand as the local economy picks up steam in the year ahead,” added Hogue. Elsewhere in the country, a majority of provinces saw improvements in affordability in the fourth quarter. Only the standard two-storey benchmark became less affordable in Ontario and Quebec, as did the standard condominium apartment in Quebec and the Atlantic region. TORONTO, Feb. 24 /CNW/ – Canada’s housing affordability continued to improve in the fourth quarter of 2010, thanks in part to slight decreases in five-year fixed mortgage rates and minimal home price appreciation across the country, according to the latest Housing Trends and Affordability report released today by RBC Economics Research. The detached bungalow benchmark measure eased by 0.8 of a percentage point to 39.9 per cent, the standard condominium measure declined by 0.4 of a percentage point to 27.6 per cent and the standard two-storey home decreased 0.4 percentage points to 46.0 per cent. A majority of provinces saw improvements in affordability in the fourth quarter, most notably in Alberta where falling home prices once again contributed to lower the bar for affording a home. Only the standard two-storey benchmark became less affordable in Ontario and Quebec, as did the standard condominium apartment in Quebec and the Atlantic region. RBC’s Housing Affordability Measure for a detached bungalow in Canada’s largest cities is as follows: Vancouver 68.7 per cent (down 0.4 percentage points from the last quarter), Toronto 46.8 per cent (down 0.5 percentage points), Montreal 41.3 per cent (down 0.4 percentage points), Ottawa 38.7 per cent (up 0.5 percentage points), Calgary 34.9 per cent (down 3.1 percentage points) and Edmonton 31.0 per cent (down 2.4 percentage points). British Columbia: Buying a home in B.C. became slightly more affordable in the fourth quarter of 2010, due primarily to a small drop in mortgage rates. After experiencing some declines in the previous quarter, home prices rose modestly for most housing categories; condominium apartments bucked the trend, however, and depreciated slightly. Prices were supported by a tightening in market conditions with home resales picking up smartly following substantial cooling in the spring and summer that saw sellers lose their edge in setting property values. Demand and supply in the province are judged to be quite balanced at this point. RBC’s Affordability Measures fell between 0.8 and 1.0 percentage points in the fourth quarter which came on the heels of much more substantial drops (1.7 to 4.8 percentage points) in the third quarter. Notwithstanding these declines, affordability remains poor and will weigh on housing demand going forward. Alberta: Alberta officially became the most affordable provincial market in the country in the fourth quarter, according to the RBC Measures which fell once again by 1.0 to 2.4 percentage points, extending their declines since late-2007. In addition to the lower mortgage rates, the further depreciation of home prices contributed to lowering homeownership costs. Property values were negatively affected by a substantial downswing in demand in the spring and early summer, which put buyers in the drivers’ seat. The significant improvement in affordability is near the end of its line, however, as demand has shown more vigour in recent months – alongside a provincial economy that is gaining more traction – and the market has become better balanced. RBC expects that this will stem price declines this year, thereby removing a potential offset to the negative effect of projected rise in interest rates on affordability. 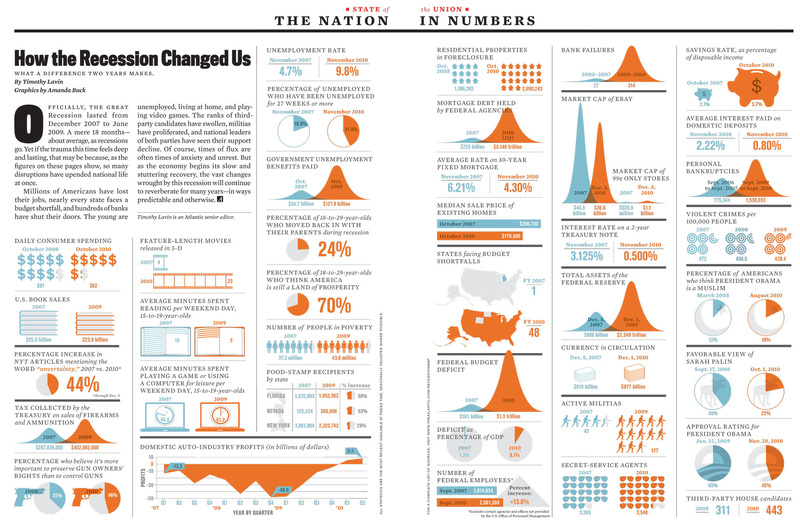 Below is a very cool graph on how the worst recession of our life times has changed the American life-style. Click on it to make it nice and big. COMMENT: This is a very cool index I found that compares most investments to real estate. It is interesting right now as gold is at an all time high, oil is back up and Canadian real estate has held most of its value and is coming back. Here is the “ORES REAL ESTATE INDEX” which tracks the average resale prices of single family homes and condominiums in the Greater Toronto Area (GTA). It also tracks certain benchmark comparisons such as the price of oil and gold, as well as the Consumer Price Index. For ease of comparison, everything we look at is worth 100 points on the Index as of 1 January 2005. That time period compares favourably with the five year average used as a standard benchmark comparison in the mutual fund industry. Just a quick note on reading the information. Have a look at the ORES Index for Real Estate (single family homes). As of the end of January, the index stood at 132.15. That’s a 32.15% increase in 73 months. That means the increase is 0.404% monthly, or it could also be expressed as 5.28% annually. The performance here is shown without annual compounding for the sake of simplicity. • Actually, I should have mentioned that if you held gold bullion, you could sit in a room, count it, and enjoy that experience too. I’m not quite sure how to measure that. You’ll have to ask King Midas or Goldfinger! • All three US stock market indicators now show positive numbers. If you are a student of economics then this is “interesting.” If not then it will make no sense at all. I think he is accurate in summarizing where “hidden inflation” will come from at the end of the post. TORONTO, Dec. 15 /CNW/ – Alberta’s economy continues to recover from its severe recession with real GDP set to grow 3.4 per cent in 2010 and then galloping to a solid 4.3 per cent in 2011, according to the latest Provincial Outlook report from RBC Economics. In 2011, RBC projects that Alberta’s economic growth will be second only to Saskatchewan, representing the fastest growth in the province since 2006. Alberta’s strong forecast is owed to improvements in a number of areas, particularly the booming energy sector and increased job creation since spring which helped to bring down the stubbornly high unemployment rate. The RBC report notes Alberta’s employment sector is expected to lead the country with a rise of 2.3 per cent in 2011, up significantly from a scant 0.5 per cent in 2010. The anticipated increase represents the creation of 37,000 jobs and will usher in the highest total of new employment opportunities since 2007 which should ultimately contribute to a boost in population growth. “With interest in developing Alberta’s oil sands growing ever higher, the gush of capital spending on megaprojects is expected to continue next year and beyond. This will pump tremendous activity into the provincial economy and act as a catalyst for both faster job growth and stronger migration from outside the province,” added Wright. According to the RBC Economics Provincial Outlook, the impact of Alberta’s strengthening demographics will be especially positive for consumer spending in 2011 as retail sales are expected to soar to a rate of 5.6 per cent, higher than any other province. This, along with the 5.1 per cent increase in consumer spending expected this year, will go along way toward reversing the massive 8.4 per cent decline experienced in 2009. Looking ahead to 2012, the rising tide of energy-related spending and the expanding of non-conventional oil production will continue to exert powerful lifting forces throughout the Alberta economy. RBC forecasts the province will sustain a solid pace of growth with GDP of 3.8 per cent which will keep the province near the top of Canada’s growth rankings. The RBC Economics Provincial Outlook assesses the provinces according to economic growth, employment growth, unemployment rates, retail sales, housing stars and consumer price indexes.